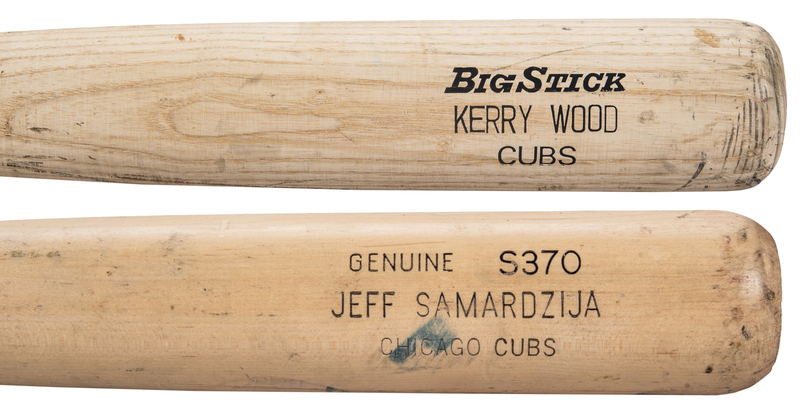 Offered in this lot are two game used bats from former Chicago Cubs pitchers – Kerry Wood and Jeff Samardzija. 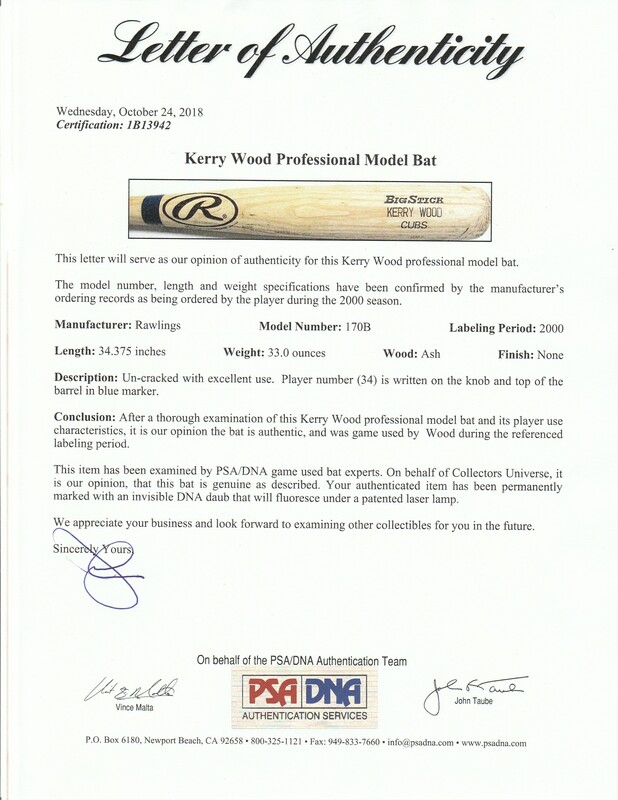 Wood used this Rawlings 170B model bat during the 2000 season. This bat displays excellent game use and is un-cracked. There are some ball marks and cleat imprints present on the barrel. Wood’s number “34” is hand written in blue marker on the knob and top barrel. This bat comes with a LOA form PSA/DNA (1B13942). 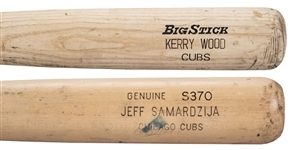 The second bat in this lot was used by Jeff Samardzija during the 2013 season. 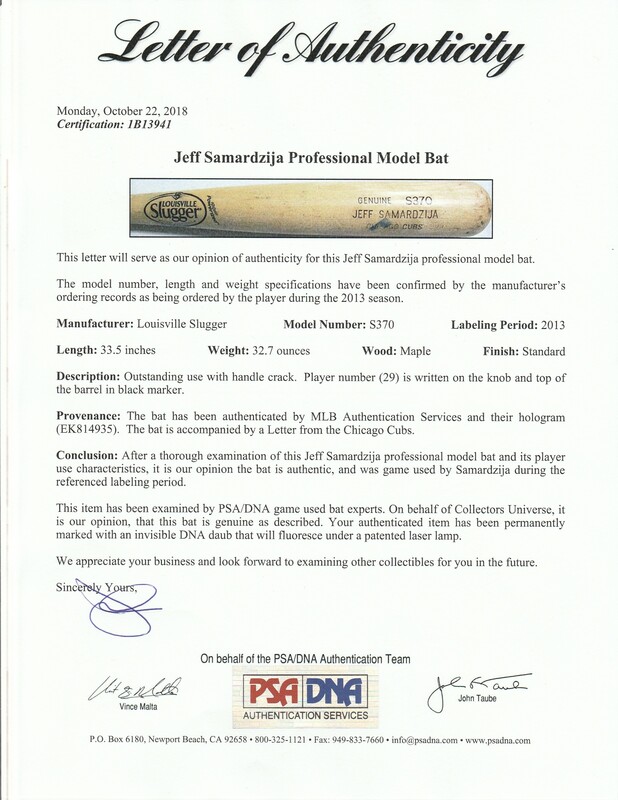 Samardzija’s Louisville Slugger S370 model bat displays outstanding game use and has a crack on the handle. There are ball marks, large blue ink transfers and cleat imprints on the barrel. The handle has a coating of Mota Stick. 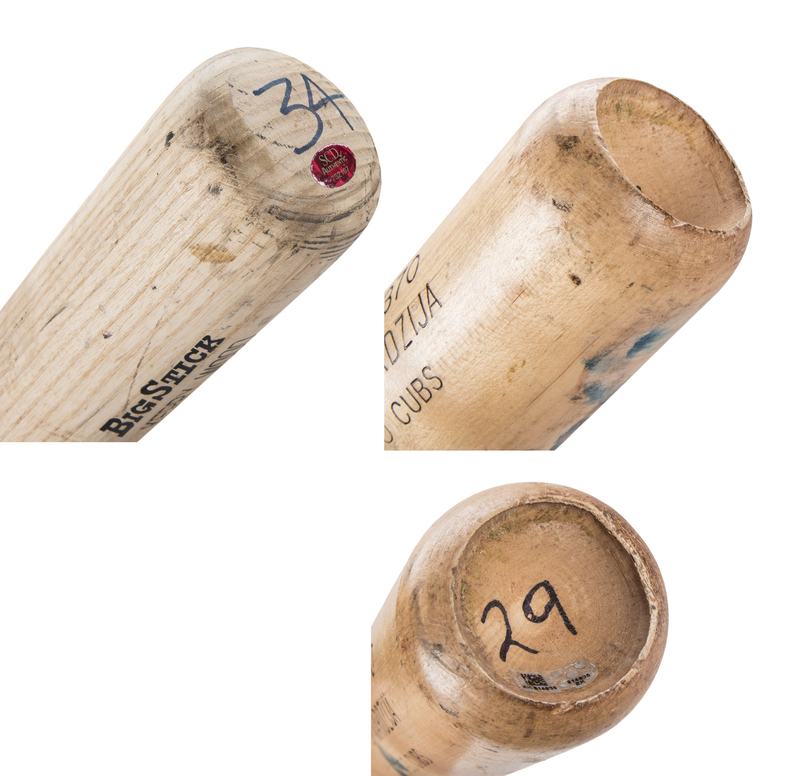 Samardzija’s number “29” has been hand written in black marker on the knob. 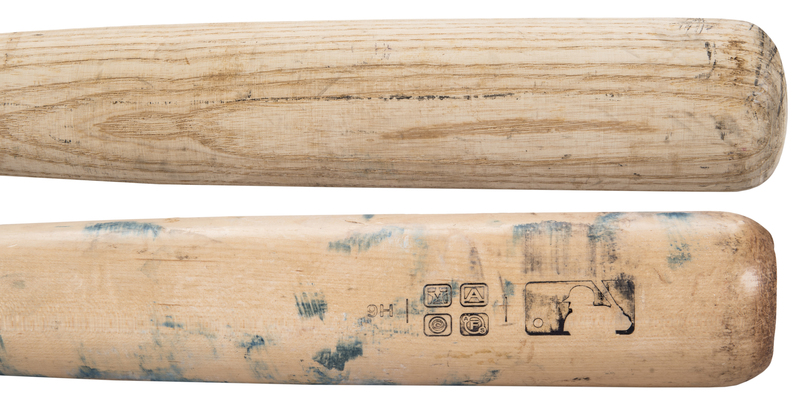 This bat comes with a LOA from PSA/DNA (1B13941) and a MLB Authenticated hologram (EK814935). Please note that MLB has labeled this a “Team Issued Broken Bat” a common designation for items collected not on the same day of an event. 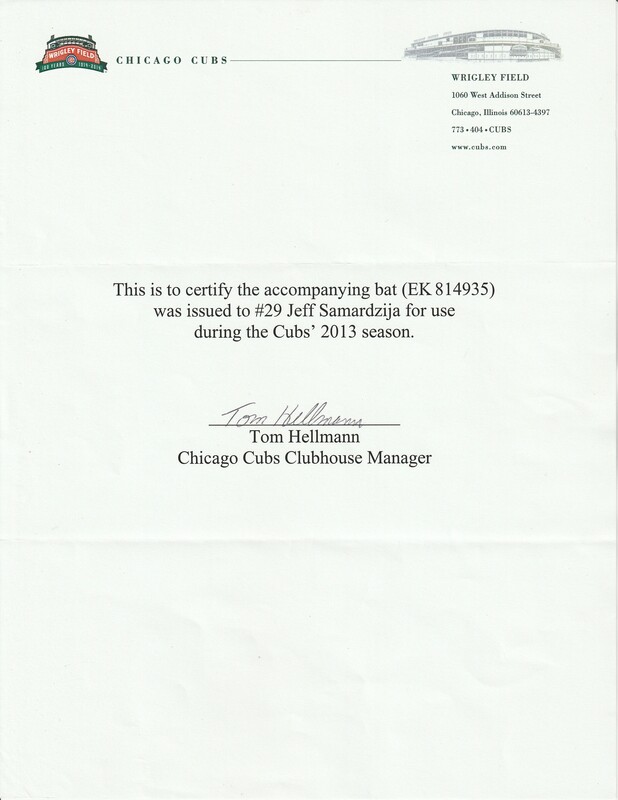 Additionally, there is a LOA from Tom Helmann, the Chicago Cubs Clubhouse Manager who certifies that this bat was used by Samardzija during the 2013 season.